I’ve been fascinated with the work of British investigative blogger Eliot “Brown Moses” Higgins for some time now, in part because he is a classic example of how someone with the right skills and motivation can use the social web to function as a journalist with little or no professional training. Last year, Eliot created a site called Bellingcat to build on the work that he and others are doing around real-time verification, and now the team has launched a project designed to develop a crowdsourced database of military activity in Ukraine. Higgins and Bellingcat have been working on identifying and cataloguing movements of armored vehicles, troops and other activity in and around Ukraine ever since Russia started interfering in that country and then subsequently annexed the Crimean peninsula. In one of the site’s major efforts to date, it used social media and various other tools to help confirm that Malaysian Airlines flight MH17 was taken down by pro-Russian separatists with a BUK M1 missile launcher last July. The site did this using much the same process that Higgins (whom I consider a friend) used when he was the first to confirm that the Syrian government had used cluster bombs against its own people in a series of attacks. By correlating images and video clips — which in many cases were posted by militant groups themselves — with locations from Google Earth and other sources with data about the area and military hardware, Higgins was able to establish how the attacks occurred, and the specific types of weapons that were involved. 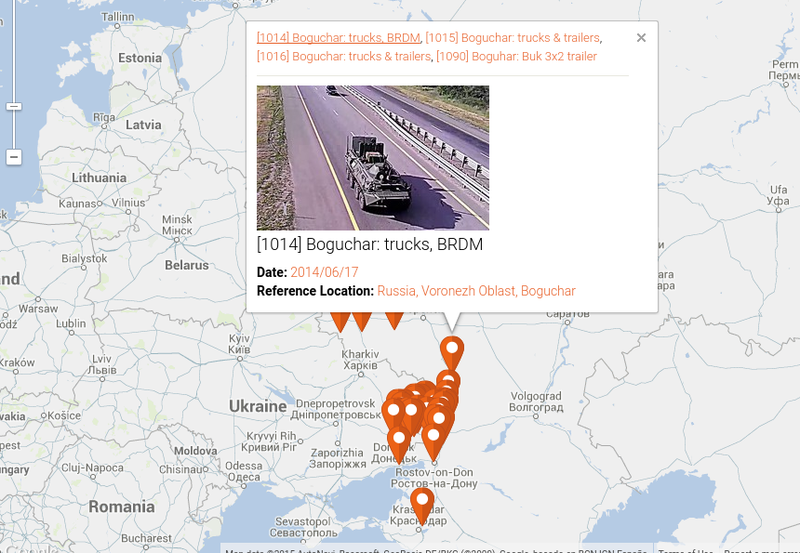 For the Ukraine project, Bellingcat has created a real-time database of Russian and Ukrainian military movements, with photos and geographical location information, and has opened that database up for anyone to contribute to. For verification, the team is using its own expertise as well as a service called Checkdesk, a live-blogging platform that was started by social-technology group Meedan and won a Knight Fund challenge last year. And the data behind the project is all being hosted publicly through a site called Silk, which allows anyone to see, embed and potentially even modify the data. As a blog post at Bellingcat describes, the project was jump-started with the data that Daniel Romein put together while trying to confirm when and how Flight MH17 was attacked. But Bellingcat team member Veli-Pekka Kivimäki says the site didn’t want to just post a photo or location every time there was a new confirmed sighting of troops or vehicles in Ukraine — it wanted to create a database that would grow and evolve with each new piece of information. Using Silk as a data platform means the information about military activity and identification of vehicles and weaponry can be continually updated, Higgins said. And because of the way Silk works, anywhere the representations of that data are embedded — whether as maps or image galleries — will automatically be updated when new information is added. “There’s already a lot of people working on collecting and geolocating these videos, so we know there’s plenty of information out there already, it just needs to be collected in one place,” Higgins said. Bellingcat team member Kivimäki notes in the blog post that the hope is to “build a large data set that can be mined to make entirely new discoveries.” So, for example, a group of vehicles was seen travelling towards the Donetsk region in June, and similar vehicles were seen in Ukraine the same day — were they the same ones? The data hosted in Silk is broken down into three categories: Sightings contain links to whatever media is available — whether it’s photos or video — along with data like location, type of equipment, etc. These can also be grouped. Another category is equipment, which contains a list of the different kinds of weapons and vehicles that have been seen. And the “unique units” category collects items that have been conclusively identified, via licence plate or other ID. Plenty of media outlets are tracking and reporting on what’s happening in Ukraine — but Higgins is the only one I can think of who is taking a completely open approach, not just with his reporting, but with all of the images and videos and geographical data related to that work, to the point where anyone can embed and/or contribute to it. That’s a model more media companies could stand to adopt, in my view, and a great example of the benefits of crowdsourced verification and networked or “citizen” journalism. Hey GigaOM… Lemme tellya, you know nothing about military equipment. Your screenshot above has 3 different pieces of equipment none of which are Pantsir-S1 as the picture says. You’re reporting on something that has few (very few in fact) pictures, some of them with green leafs in Russia in December… Please, just stop and go back to your usual technology reporting, at least you know something about it. Ok ruski, how is Moscow out your window ?